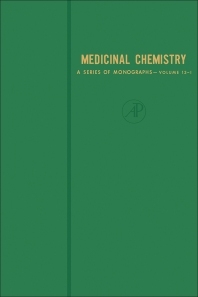 Medicinal Chemistry: A Series of Monographs, Volume 13–I explores the development in the treatment of some severely debilitating chronic inflammatory diseases, including arthritis, gout, rheumatoid arthritis, osteoarthritis, systemic lupus erythematosus, psoriasis, conjunctivitis, episcleritis, and uveitis. This volume examines the anti-inflammatory drugs used to alter the inflammatory response in diseases of unknown cause. This book is comprised of two parts encompassing 11 chapters. Part I discusses the factors that cause the inflammation and explores the interaction of these causative agents with those therapies found to be clinically effective. This text also presents an illustrative classification of some debilitating inflammatory conditions and the available therapy. Part II explores the nonsteroidal anti-inflammatory agents that are peripheral analgesics and anti-pyretic. Other chapters review colchicine and allopurinol as anti-inflammatory drugs for gout. Finally, this volume ends with a discussion on the anti-inflammatory activity of some proteolytic enzymes of vegetable, animal, fungal, and bacterial origin. Physicians, chemists, and experimental biologists will find this book extremely useful.